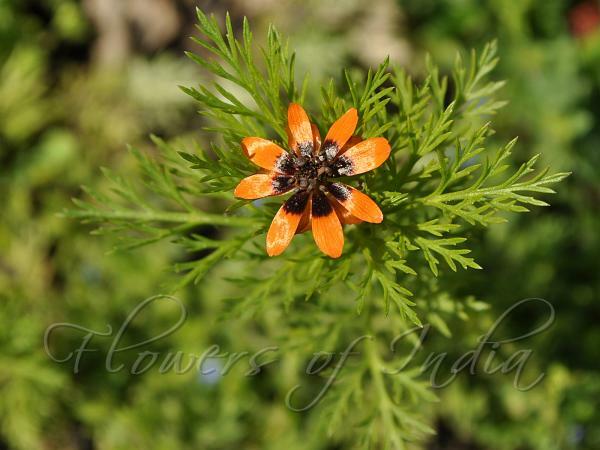 Pheasant's Eye is an annual weed found growing in corn field in the Himalayan region. It has small scarlet or golden-yellow flowers with dark purple centers. Flowers are 1-2 cm across. Sepals are green or slightly colored. Petals are a but larger, 5-8 in number. Leaves are feathery, pinnately divided into thread-like segments. Stem is leafy 15-30 cm tall. Fruiting head is oblong. Achenes have a network of depressions. 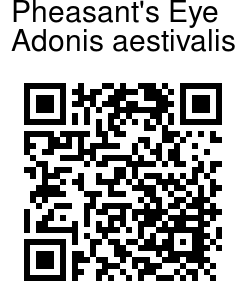 Adonis is named after a very handsome young man in Greek mythology, by the same name. Pheasant's Eye is found from Pakistan to Nepal and Temperate Eurasia, at altitudes of 1200-3000 m. Flowering: April-June. Identification credit: Pravir Deshmukh Photographed in Lahul Valley, Himachal Pradesh.